Google Buzz: what do you want to share today? 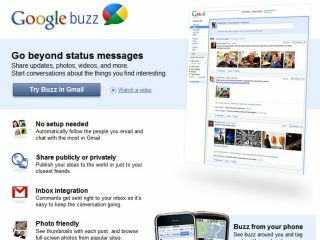 Google Buzz is here! How do we know? Because everybody's talking about it on, er, Twitter. Ho ho! Cheap gags aside, Google Buzz is an interesting development - not because it's Google's latest attempt to move into social networking and not because it has some worrying privacy implications, but because it makes your email sociable. Unlike Twitter or Facebook, which are designed as stand-alone systems, Buzz piggybacks on Google Mail, turning your email address book into a social network. There are some interesting ideas in it - for example, it uses a kind of PageRank so that you can filter out people's "What I am having for breakfast" messages without having to unfollow them altogether - but despite this, we're not convinced that our email really wants to turn into Twitter. Don't get us wrong. It's probably a brilliant idea if you work for Google. If you're one of the hip young things at Google your address book is likely to include all the people you socialise with, because you probably socialise with the other hip young things at Google. For those of us who don't work for a hot US tech company, however, our address books are more likely to include the people we don't socialise with - and that's the last group of people we want to be sharing our drunken, angry or downright disturbing status updates with. Although it's possible to split personal and public - you can make posts private, which limits them to a selected readership - it's a lot of faff, isn't the default and clearly isn't what Google would like you to do. As we've seen time and time again, a single social network where everyone is equal is a bloody disaster. Whether it's callow youths uploading stupid things and ruining their career prospects or sickie-pulling skivers who've forgotten the boss is part of their network, whenever the private, the personal and the professional come together you end up with photos of somebody's bare arse ending up in the wrong person's inbox. Even if you're not posting things that could get you fired, chances are you have different audiences for different kinds of status updates - so there are things you'll happily post on Twitter that you wouldn't post on Facebook, or links you'll share on Facebook that you wouldn't email to your Dad. That's a good thing, because the people we know aren't equal. We have fun friends and serious ones, close family and crazy relatives we keep at arm's length, acquaintances and people whose friend requests we only accepted because we thought they were somebody else. What's appropriate for some or even most of those people isn't appropriate for all of them. Buzz is a very Google approach: having everything together - your email, your status updates, your documents, your YouTube favourites, your - cough - Google Waves - makes perfect sense to Google, because it just happens to be a brilliant way of amassing lots and lots of data about you. In the real world, however, things are a bit more complicated than that.